I was so excited all week to do this post. Not just because it’s my Bargain Site of The Week but also because I have some great things to go along with it. First, let me introduce you to Tanga. Tanga is a great place to get some awesome daily deals. Each day at 8:00 pm MST they have 6 new products in 6 categories: T-shirts, Magazine, Electronics/Gadgets, Accessories, Games and Good Till Gone Misc. Their prices are some of the best around and you can even play some puzzles and have some fun while you are over there. It’s a site you will want to bookmark and check back to everyday to see what goodies are available. 1. 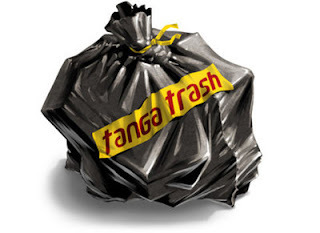 Leave a Comment – Tell us what you think may be in the $100 bag of “Tanga Trash”. If you do not have a blog, please be sure to leave your email address otherwise I will not be able to contact you if you win. 2. Follow My Blog Via Email or Reader – you can subscribe in the right sidebar. Please be sure to comment back to let me know you did it. 3. Follow Me On Twitter – Follow me on Twitter at www.twitter.com/LivinRichCoupon and Tweet about this giveaway. Make sure to copy me on your tweet by adding @LivinRichCoupon. Also comment back on the post that you have done this. 4. Follow Me On Facebook – Use the facebook link on the right sidebar. Please be sure to comment back to let me know you did it. Note: This giveaway is provided by Tanga.com. Living Rich With Coupons was not provided with any compensation to post opinions about Tanga.com.